Without windows, primitive shelters tend to be dark. Especially during the long, dark nights of winter, lighting in addition to the fire is helpful for working on projects. 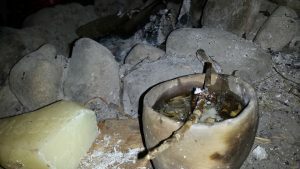 Candles and oil lamps are used indoors and torches can be used outdoors. Handmade pottery from local clay and bees wax candle. Cordage wick. 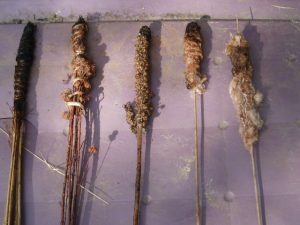 Torches made with cattail, mullein and rendered animal fat. Turtle shell and bees wax candle. 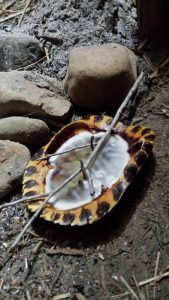 The other half of the shell can be used as a base on which to set the candle.